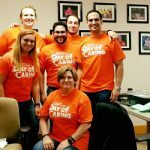 KANDU Industries Inc.United Way’s Day of Caring - KANDU Industries Inc.
On Wednesday, September 19th, Kerry Foodservice participated in United Way’s Day of Caring by choosing to support KANDU’s mission. Six employees from Kerry volunteered, assisting the Marketing/Fund Development department with assembling the annual appeal mailing. Not only did these enthusiastic volunteers finish compiling and stuffing everything given to them, but stayed hours past the scheduled finish time! Thank you, Kerry Foodservice and volunteers, for saving KANDU many hours of labor, allowing staff to focus on other opportunities that further contribute to our mission.